http://mrfastfinger.net/index.php/cla...The tune was originally composed for the Air Guitar Warrior -game (Xbox one) by Air Guitar Company. The graphics and sound effects are from the game. Music composed by Mika Tyyskä. Thank you to Air Guitar Company for letting me use these here. See the offical trailer here: https://www.youtube.com/watch?v=1sQYx...Gallopping riffs, Phrygian Dominant and Aeolian scales, alternate picking patterns, open fire with pedal tones, smooth tapping and fast arpeggios. Remember no pain, no game. This is a serious workout but don't hurt yourself. The slowed down backingtrack was created with iPad app Anytune Pro , I recomment downloading this or looking other apps or softwarers for your computer. Download the backing track mp3 from mrfastfinger.net and adjust the tempo to suit your current skills! 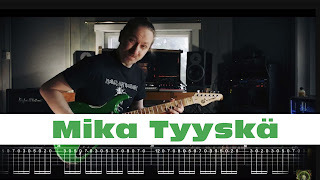 Make sure you check out my new JAM WITH MIKA TYYSKÄ at JTC. Here's a full tune "The Hills 1986"